Esther Klok, a veterinary technician at Dierenkliniek Winsum in the Netherlands, previously described her passion for bringing new ideas from the NAVC Conference home to her clinic in 3 articles in 2016 (available on TodaysVeterinaryTechnician.com). In this article, she outlines how her clinic designed a program that not only helps dogs with noise anxiety, but also improves the human–animal bond and has even increased community awareness of how noises affect animals. As veterinary technicians, we are often very busy from the middle of December through the beginning of January. At my practice, we have such long lines at the front desk that it sometimes appears as though we are giving away something for free! (During this time, vet techs need a lot of chocolate to stay happy.) But there’s more to this stressful season in the Netherlands, because everyone is allowed to light fireworks in honor of the New Year. They not only do it while it’s allowed, but they love to start 2 weeks early. Sometimes it sounds like a war is going on outside, because our windows clatter and the ceiling sounds like it’s coming down! A lot of animals are so afraid of the noise that it becomes a big problem for their owners. So all the owners come in and ask for MAGIC! Specifically, they want to know if we have medicine to help their pet not be afraid. The best solution? Helping the animals learn to cope with fireworks and noises. Fireworks are not the only sounds that can be a problem. For example, one of our patients was a 5-year-old Labrador retriever that lived 3 months of the summer on a sailboat. The owners and the dog loved it! One day, however, the dog was sleeping on the high deck, and something exploded near the boat. The dog was so shocked that he fell down on the lower deck. From that day on, he started to run whenever he heard loud noises, and that became a serious problem. On one occasion, the owner and dog were walking in the fields when a hunter shot a duck. The dog was so afraid that he ran away through the fields. The owner saw him disappear and searched for him all night, but it took 2 days to find the dog. The problem was progressively getting worse. When the dog heard the sound of a pan clatter while the owner was cooking, he was so afraid that the only thing he could do was get out of the house. Another one of our patients had a problem with both sounds and light. When the owner was taking pictures, the dog would panic and run. Even the doorbell or a loud truck on the road was a trigger to run away. Then, of course, there are all the dogs that are terrified of thunder and lightning. One dog was so afraid that the owners put him in a big kennel in the quietest place in the house. They thought he was safe. But the dog grew so panicked that he ate through the wooden back wall of the kennel, injuring himself. He came to us with his legs and mouth covered in blood. Faced with all of those people in line at the front desk during the 2 weeks before New Year’s Eve, I wondered if we could do something to help those animals and their owners. Something more than giving the dogs medicine and knowing that it was not the best solution. Well, you all know what happens next. You don’t get much sleep when new ideas are popping into your head all night! Provide a 3-month course for dogs and owners who want to have a good New Year’s Eve experience, followed by a good rest of the year without being afraid of noises and fireworks. The next morning, I told the rest of the team about my plan and was a little bit afraid of their response. They always end up with more work because of me! So I was very happy that, when I told them my idea, they were enthusiastic. But I did have to promise them that I would try to keep the amount of work as small as possible. We decided we should hire the best certified dog trainer we knew to conduct the lessons and that there should always be 2 vet techs available to help him. Lucky for us, the trainer was really enthusiastic about the idea and immediately said yes to our training schedule. We had a few meetings to talk about how we would like the lessons to be and what his ideas were. It was important that both the trainer and the veterinary staff felt comfortable with the training. There are really good trainers who can do amazing things with dogs, but sometimes they do not prioritize the emotions of the owners. When the owners do not feel good about something, they will not finish the lessons. On the other hand, a trainer has to be firm. You have to work with both the dogs and the owners to succeed. So, first things first: these classes needed a trainer who was good with dogs and with owners. The veterinary staff needed to “click” with the trainer as well, because we had designed an intensive 3-month training session that would be emotionally heavy, not only for the owners, but also for us! We designed a 3-month course because both dogs and owners need at least this much time to learn and change habits, but a longer course runs the risk of being too expensive for owners to consider. The first lesson took place in our vet practice. We had 4 groups of 8 dogs each. During the first lesson, we let the owners tell the rest of the group what their pet’s problem was. Then we started to find out what each dog loved the most—a toy, food, or something else. This was very important because, to get the best results, each dog needed to keep its attention on the owner, so the owners needed to have something their pet adored. Also, when a dog is afraid, you have to try to shift it out of that mindset. When we explored in a group what the dogs liked, the owners learned from their own dogs as well as the other owners and dogs. The homework for the owners after the first lesson was to find out what their dogs liked the most in attention, food, and toys. Toys with sounds are very important for getting a dog’s attention, so they were urged to find one. FIGURE 1. The class in the horse arena. The next lesson took place in an indoor horse arena, but with no horses in the building. The floor of the arena we used was covered with sand, so the dogs didn’t have to worry about sliding around (FIGURE 1). The first part of the lesson was to let the owners walk and try to keep their dog’s attention. It sounds strange, but just this first step made some owners start to cry from happiness. They didn’t even know how to begin this basic process! For me, it was very important to not judge people who didn’t understand such basic things. I started this course to help people. It’s easy to think, “Why didn’t you go to puppy training?” I had to clear my head and only be proud of every step forward the owners made. The homework for the owners after the second lesson was to keep their dog’s attention in various situations. For the third lesson, we started with a noise CD we made ourselves. The trainer and owners played with the dogs in the enclosed arena with the sounds of fireworks and thunder and lightning in the background. Not too loudly at first, because we would gradually make it louder at every lesson. Owners received tips and tricks from the trainer, and the best part was seeing the trainer get the attention of the dog. In a few seconds, most of the dogs turned around and walked with him as if there was no sound. This was an eye-opener for most of the owners and a reason to work even harder to accomplish the same goal. During this lesson, it was important to have 2 vet techs present, so we could help where necessary. For example, we could hold a dog while the owner was talking with the trainer. Or when somebody was crying (emotions are sometimes really high! ), we could bring a cup of coffee or a just put an understanding arm around the owner. For the homework after this third lesson, all the owners received their own noise CD and had to practice with the tips they were given by the trainer for themselves and their dog. For the fourth lesson, we repeated the previous one. When it went well, we turned up the CD a little louder. Then we put a van inside the enclosed arena. Every owner had to crawl through the car with his or her dog and make a game of it! They used a toy, and the purpose was to have fun together. Once the pairs accomplished that, we played the noise CD inside the car. Now everybody had to have fun and go through the car the same as before. And it worked! Why? Because the owners were focusing on getting through the car without being stuck, which meant they did not pay attention to the sound and neither did most of the dogs! A few dogs were affected by the noise, but the trainer stepped in and managed to get all the dogs through the car. The homework following this lesson was for the owners to use the noise CD in different places, such as in a backyard or at a dog park. In this lesson, we introduced a strobe light, because sound is not always the only problem. Flashing lights can worsen the situation. We followed the same procedures as we did when we used the sound. The first task was to get the dog to focus on the owner by using, for example, a toy. The trainer brought a big bag of toys so everybody could use one that their dog liked (the favorite was a ball with a beeping noise). The homework for this lesson was to use the noise CD and a camera flashlight at home to simulate lightning and thunder as well as fireworks. FIGURE 2. A dog approaches the smoke. In this lesson, we introduced smell. Interestingly enough, even though most of the dogs had become really relaxed with all the sounds and lights, as soon as we added the sense of smell, they fell back into their old behaviors and were afraid. But when we started the process over again, they recovered and responded faster, and at the end of the lesson, we were almost back to the same level as at the beginning. So if you take a step back, work hard to take another step forward. Don’t be disappointed if the dogs need some extra time. It’s all part of the learning process and the road to success! The homework following this lesson was to practice with sparklers. Once again, we repeated the previous lesson. Once that went okay, we started popping balloons. Air pressure differences can be a problem for dogs. We started with very small balloons, which most of the dogs did not seem to mind. I was surprised, but it really showed how much we had progressed! This was another emotional moment for the owners, because they started to believe it was possible to get an amazing result out of all the work they had done. What a beautiful moment this was! The homework following this lesson was to get the whole family involved with popping balloons. The owners were supposed to ask people to hide along their dog-walking route (e.g., in the city, in a park). Those hiding were not allowed to tell the owners where they would be, so the owners would also be surprised when they jumped out and popped a balloon. The reason for this is that people react differently when they expect a bang. One of the owners told me that he asked the teenaged loiterers in his village to work with him…and they did! He said that it took 2 weeks of intense practice to achieve the desired results (also for his heart to get used to it). The results? An anxiety-free dog and more understanding from the youth in the village about dogs and their fear of sounds. 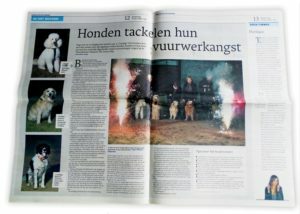 Now the teenagers are not as likely to use fireworks around dogs. In this lesson, it was finally time to use real fireworks. We had purchased some made for children. A team of helpers (the wife of the dog trainer, two colleagues, and another dog trainer) was there, and we split the attendees into 2 groups so the trainer had a good eye on all the dogs. Of course, there was also a team of vet techs and a veterinarian. The trainer let the owners do some exercises to show the dogs were paying attention to them. It was amazing to see. Everybody had worked so hard at home. The owners understood their dogs better, and the result was less stress for both the owner and the dog. Only one dog was still not doing very well with everything. We could see that he needed more time, so at this stage, we took him out of the classroom and worked with him alone so we could see what the dog and owner needed to do to progress. Again, we repeated the previous lesson. We encouraged the owners to help each other out when an owner or a dog was in trouble. Then we told them to be ready for the final week. We were ready for our own firework show! Outside the training location a week later, there was a firework show. Loud noises, smoke, and lots of colors filled the air. And there we were! The trainer, many dogs, and many owners. And, of course, the vet team. The feeling for everyone was the same: we were so PROUD! We all did it together. 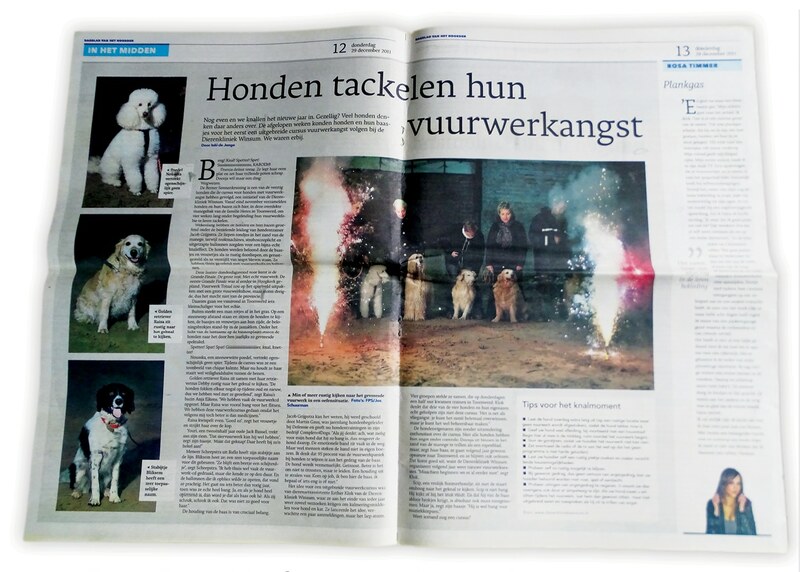 Everybody worked really hard and did it because of a mutual love for the dogs. It felt super to see them, heads and tails up! When you see a tear on the cheek of a happy and proud owner, then you know…we did good! FIGURE 3. Publicity for the practice and the class! It is important to note that, after the classes, the trainer and vet talked to all the owners. In some cases, it still might be necessary to get extra help from products like Zylkene (vetoquinolusa.com), which helps dogs with lower anxiety levels, or clomipramine, for dogs who have a bigger problem. Our veterinarian talked with the dog trainer, and they decided together if a dog needed medication. Then our vet decided what kind of medication to prescribe and informed the trainer about it, with follow-up conversations about how it worked and whether a change in dose or medication was needed. 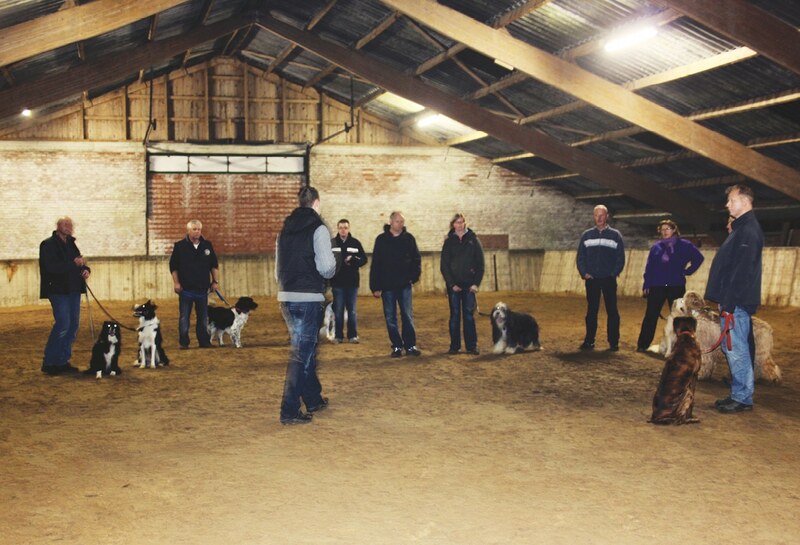 During the classes, it was up to the trainer to assess each dog’s anxiety level and explain it directly to the owner as he worked with the dog. He taught the owners to observe their pet’s body language and recognize different moods. 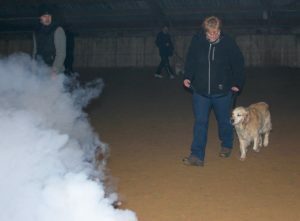 Most of this was in the very first lesson, but some dogs started showing much more anxiety when we reached the smoke machine. 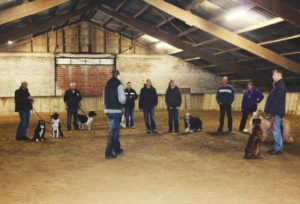 So the owners and the trainer got to see the dogs’ behavior change, and at that moment, the trainer would talk about it with the owner and the group, because it was a learning experience for all of us—owners, trainer, and vet staff. This course is perfect for a dog trainer to show owners all the signs of anxiety, fear, and happiness! We try to keep the fun high in all the lessons, for dogs and owners. Every dog is different. If a dog needs more time, we try to work with the owner individually. Some dogs and owners have taken the course more than once. I hope many of you will dream tonight about great ideas. I know we, as vet techs, already work so many hours. I know we do not make a great deal of money. I also know that firework training is not in our job description. But…I know that we, as vet techs, can make a big difference! We have a love for dogs. We have a great deal of patience. We have enough knowledge about the behavior of dogs and their owners to help them. We have a big shoulder to cry on. We have the strength to reach a goal, even when we take a few steps back. We are there to help dogs and people where and whenever they need us. That’s who we are! Overall K, Seksel K. Behavior: pharmacotherapy. vetstream.com/canis/Content/Freeform/fre60065. Accessed September 2016. Overall KL. Noise reactivities and phobias in dogs: implementing effective drug therapy. veterinarynews.dvm360.com/noise-reactivities-and-phobias-dogs-implementing-effective-drug-therapy. Accessed September 2016.